The project concludes works to this narrow mid-Victorian terraced house in Kentish Town, North London. In 2013 the ground and rear of the property were fully refurbished and re-modelled. The client’s brief was to develop the loft and provide a bedroom and shower room as well as good storage. 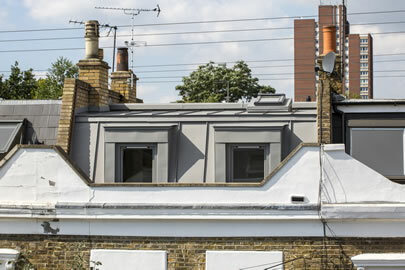 The materials used on the loft extension are pre-weathered zinc in combination with pre-finished Accoya framed windows to provide a long term low-maintenance solution. A sliding window to the rear has a useful seat within its width as well as a simple external guard made of stainless steel frame and mesh to keep the aspect open. The client was keen to ensure as much natural light and ventilation as possible are provided at the top of the property. The loft room runs front to back and the extended stairwell is pulled back from the rear of the house to maintain light to the floor below.